eBay reveals its iPad 2 sales number & it's HUGE! Incredible. 12, 000++ iPad 2s have been sold in eBay roughly one month after the launch of iPad 2. While Apple is still not saying anything about the official numbers of iPad 2 sold since its launch in March 2011 eBay has release the infographic above about the total sales that eBay has sold. This year saw an increase of inside US sales (65% for 2011) compared to last year’s 30%. Russia and France shared the second spot with roughly 500++ iPad 2. Following closely are Hong Kong, Japan and United Kingdom which import roughly 350++ iPad 2. 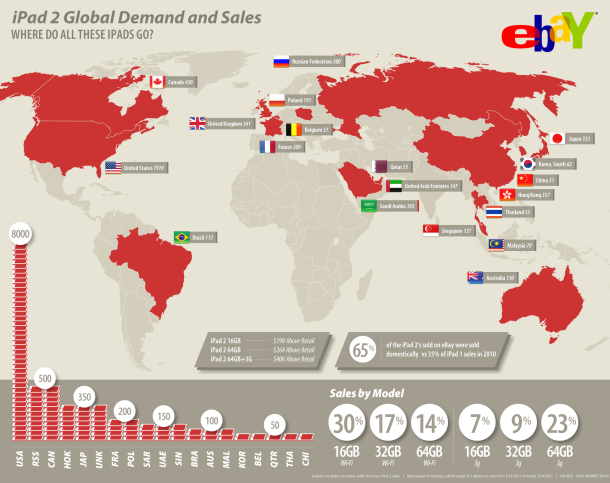 Even our country, Malaysia is mentioned in the infographic, importing roughly 100++ iPad 2. The most popular iPad 2 models are from the two ends. iPad 2 16 GB WiFi model makes up to 30% of the total sales and ipad 2 64GB WiFi + 3G model makes up to 23% of the total sales. So, back to the main issue. Apple, please let us know the exact date of iPad 2 launch date/release date! I need to book my flight tickets!!! Apple Store Online Ordering for iPad 2 is available for Australia & New Zealand!!! 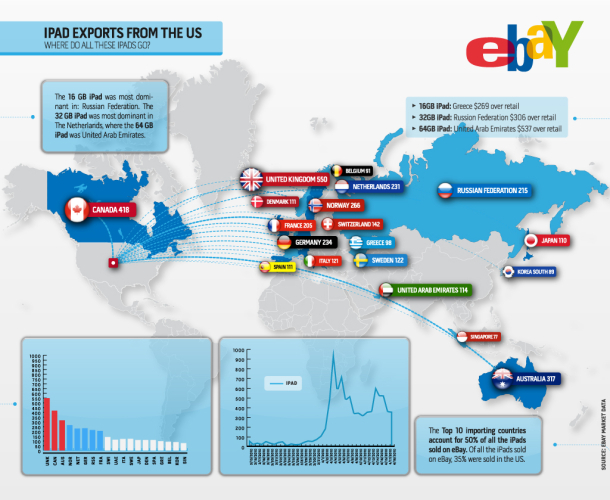 Tags: ebay ipad 2ebay ipad 2 infographicebay ipad 2 sales numberebay ipad 2 sales reviewipad 2ipad 2 canadaipad 2 canada importeripad 2 official sales numberipad 2 russiaipad 2 russia importeripad 2 sales numbershould i buy ipad 2 from ebay? Next story iPad 2 launching in Singapore, South Korea and Hong Kong on April 22, 2011? Previous story iPhone 5 June 2011 Launch will be delayed to October 2011?